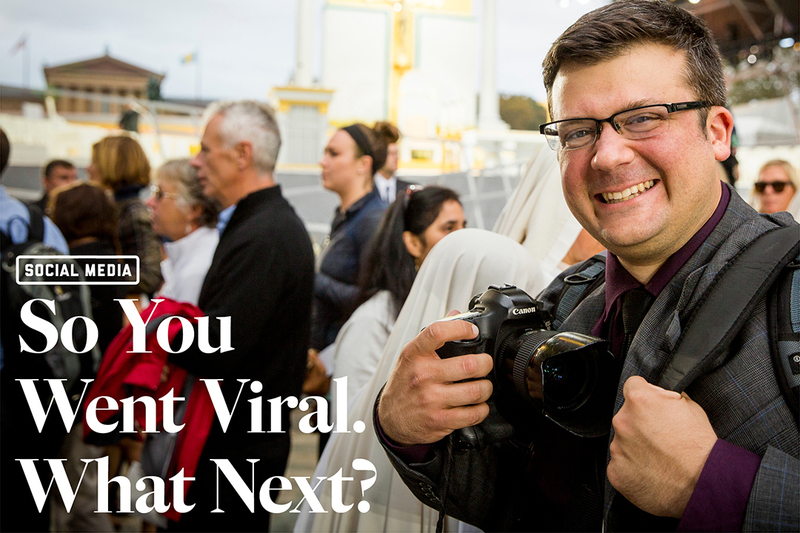 A run of viral-photo glory has left Joe Gidjunis, BA '04, with questions. "What is next?" he says. "What are you supposed to do? Or how do you top it? I don't know the answer yet." From July 2014 to September 2015, Mr. Gidjunis, a 33-year-old Philadelphia-based wedding photographer and former newspaper reporter, has had his work go viral three times—including twice in a one-month span. First, it was a picture of a bride's reflection appearing to kiss a shark instead of her intended at a New Jersey aquarium. That was July 2014—four years after it was taken. Mr. Gidjunis says the picture (he can prove the shark isn't doctored) took off when a bridal-party member posted it on Reddit to mark the wedding anniversary. Then in August 2015, it was a series of photos of a bride and groom standing in the middle of a naked bike race, looking so happy to be there in downtown Philly amid a peloton of nudists. 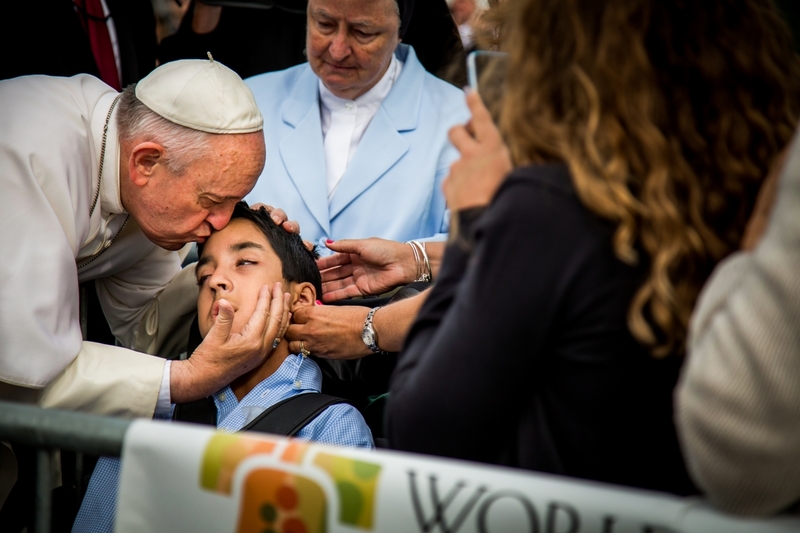 The next month, Mr. Gidjunis—persevering through a 2:30 a.m. wakeup call, numerous Secret Service screenings and his own tears—got pictures of Pope Francis' gentle moment with a boy in a wheelchair. The Associated Press picked up the photos 30 minutes later. "I'm looking at this and I'm starting to weep right there," says Mr. Gidjunis, who, volunteering as a photographer for a Catholic organization, got a choice spot on the tarmac for the arrival of the pope's plane in Philadelphia. "I'm supposed to be objective but I'm like, 'Oh my God, what has just taken place?' It was so beautiful." Name a media entity—MTV, Fox News, Cosmo, People, The Huffington Post, even The Telegraph in London—there's a good chance it's called Joe Gidjunis recently. He even went live on a Philadelphia morning show for three minutes to talk about his Pope Francis photos. And his clients at JPG Photography? Mr. Gidjunis says they're impressed. Kind of. "My next shoot after the papal event," Mr. Gidjunis says, "I went back to work and I had a wedding that same week, and everyone's excited for you. They're like, 'Wow, you shot the pope, but what are you going to do for us?'" Everything, it seems—even praise—has a caveat. That's what Mr. Gidjunis is left to consider as he comes off the greatest success, in terms of distribution, of his more than 11-year photography career. "If I ever get this attention again, it would be nice," Mr. Gidjunis says. "It would show that I'm still creative and still producing something that not many others are doing. But to say for certain I would go viral again is anybody's guess." Even after taking a photo that brought him to tears, Mr. Gidjunis had to poll the 25 or so other photographers on the tarmac to confirm whether they saw in the picture what he saw. "I'm looking at this photo and I'm like, 'Is this a really good photo?'" Mr. Gidjunis says. "'Or is it just a really good photo because I was there?'" So what has he learned from his brush with fame? If anything, Mr. Gidjunis is more confused. While grateful for the attention, he's overwhelmed by the experience and its abruptness, by what it means for his business and his craft. Months later, he's still just trying to sort it out. "No one has been calling me because I took a picture of the pope," Mr. Gidjunis says, laughing. "No one's been like, 'I want to give you money right now.' None of that happens. So you have to go back to, 'I'm here to serve. I'm going to make their [wedding] day amazing, make them feel great and do my job as best as possible.'" As for what makes a picture go viral? Mr. Gidjunis has some theories but really... "I couldn't tell you," he says. Freshman Harrison Jones took over GW's Instagram account for a week. Competing in a four-day, women-only transcontinental air race, Carole Scanlon-Goldberg, MS '83, follows a path plied by some of history's greatest aviatrixes. The maestro of the Musical Instrument Museum offers favorites from the collection. Baton Rouge-based writer Maggie Heyn Richardson, BA '90, excavates stories of Louisiana's food heritage.